1) Brush your teeth: Brushing your teeth the right way will go a long way in keeping up with your oral health. Follow a 2×2 rule. Brush twice a day for 2 minutes preferably with a soft bristled brush. Position the bristles at an angle of 45 degrees near the gum line. Use soft gentle strokes using a back and forth, up and down motion. Clean all the outer and inner surfaces of upper and lower teeth. Clean the chewing surfaces. Last but not least, Brush your tongue and roof of mouth to remove bacteria that can cause bad breath. 2) Flossing: Tooth brush bristles cannot reach in between the teeth. Flossing helps you to remove any food particles or debris present deep between your teeth. We recommend flossing at least once a day preferable at night time. 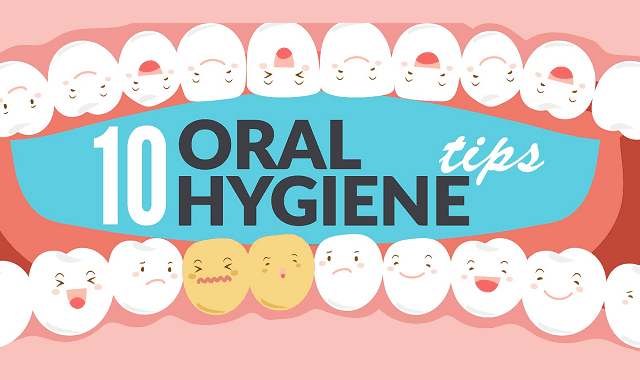 3) Clean your Tongue: The top surface of tongue is rough and can harbour bacteria. This can result in bad breath (Halitosis) and can have negative effect on your oral health. Clean your tongue daily. You can either use a professional tongue cleaner or a soft bristled tooth brush. 4) Visit your Dentist: You should visit your dentist every 6 months for a complete hygiene treatment. This can not only help you maintain a good oral health but it will also help to detect and prevent future dental treatments from occurring. 5) Mouthwash: Mouthwash is not an alternative to good brushing and flossing. But it can be a good adjunct to brushing, flossing, visiting the dentist regularly and eating well. 6) Avoid Smoking: Smoking can be detrimental to oral health. It can cause stains, lost of bone around your teeth and poor gum health. It is not only harsh on your pocket but on your general health too. Effects of smoking can last in your body for up to 10 years. Smokers have higher chance of gum disease and loose teeth. 7) Sweet Carbonated Drinks (soda): High intake of sweet carbonated drinks can result in erosive tooth wear (thinning of hard coating of tooth). This not only can make teeth sensitive but it also decreases the whiteness of tooth. Limit your intake of such drinks to meal times. Its best not to consume them everyday. Sugar in these drinks can result in high decay rate or multiple cavities. 8) Snacks which are good for your teeth: Cheese is a very good and healthy snack for your teeth. It raises the pH of your saliva and thus has anti-cavity properties. Cheese and other dairy products can be a healthy alternative to carb or sugar filled snacks. 9) Maintain your general health: Diabetes can be a risk factor for Gum Disease and Tooth Loss. Maintaining a healthy mouth and healthy gums can make it easier to control raised blood sugar levels. It is important that diabetics brush and floss regularly and see their dentist twice a year. 10) Don’t Delay Dental Treatment: Sometime people avoid getting timely dental treatments either because of fear or because they think it will be too expensive. Preventative check up and treatment do not cost much as compared to extensive care like a crown, implant or others. Follow your treatment plan as and when advised by your dentist. Delaying dental treatment can not only impact your dental hygiene negatively but can also end up costing you much more in the long run.